Ove von Spaeths book is an attempt to show how the biblical Moses was in fact an Egyptian prince and one of the Egyptian Kingdom's most powerful men until he was overthrown in a coup. Then the efforts - by the new Egyptian rulers - were to remove all traces of him. The book is the volume two in a planned series for a total of five volumes. The book is well written and easy to read - and occasionally as thrilling as a detective novel. Its historical claims, however, should simply not to be accepted at face value. Ove von Spaeth demonstrates a comprehensive knowledge of the ancient Egyptian archaeology and history. However, many of he sources also seems to be read in the same way as a crime novel: it is assumed that a place in the material hiding a solution to get things to be sorted out. But where the crime novel or tick-and-cross is designed with a solution, there is no guarantee that a similar solution can actually exist when it comes to a scattered samples of ancient sources. Newer biblical research has generally been very reluctant to infer historical information of the Old Testament reports of Moses. It was thought that first and foremost it concerned myths about Moses who, as an infant had been placed in a vessel of rush and then rescued by Pharaoh's daughter, and later Israelites in bondages were lead by him out of Egypt and through the desert to the promised land. However, Ove von Spaeth joins the number of researchers who can not or will not abandon the idea that behind Moses' "Egyptian context", something historic must hide. He places Moses in the time of 18. dynasty, a period in which the sources seem to let us come very close to the people and events. Previously, others have linked Moses with pharaohs from the 18. dynasty, not least the famous Amenhotep IV or Ahknaton (14th century BC) whose campaign for sun-god Aton has been interpreted as an early attempt to introduce a form of monotheism. Here, Freud in particular found a background of Moses' personality and work. Von Spaeth, however, goes further back in the line of kings to the fascinating queen figure Hatshepsut (16th-15th century BC) who - although a woman - ruled as divine pharaoh. Queen Hatshepsut's favourite and master of construction work, Senmut - a figure which the research has perceived as the queen's lover - who von Spaeth instead believes is the same as the queen's son, the biblical Moses. At a precisely planned coup, he - whom his mother had chosen as the heir of the pharaonic title - was overthrown by another prince, the queen's nephew. Ove von Spaeth's studies of the Egyptian material is in every sense single-handed and sometimes uncompromising, but it also happens that the exciting angles are being disclosed such as e.g. the importance of ''the star map'' in Senmut's tomb. By support from astronomy von Spaeth can obtain Senmut's/Moses' exact year of birth! The at the same time both ingenious and imaginative attempt to give the biblical Moses a historical identity, however, are being stranded by the biblical Moses-tradition's legendary character. Von Spaeth is here practising a selective use of elements of biblical texts being attributed "historical" credibility when they fit the pattern, and at other points abandoned as inaccurate. Such takes place when the narrative on how the children of Israel manufactured the Ark of the Covenant and the Tabernacle according to Moses' instructions is used to show that (the historical) Moses acted as an experienced architect. The point in the biblical narrative is that the instructions, the children of Israel follows, is not Moses' own, but are given directly by a divine revelation. About Moses' possible abilities as an architect they say nothing. The critical biblical research seems to be a feature which von Spaeth has not so great enthusiasm for; what is said about it is in several cases of pure caricature; and the author ought, of course, to have been corrected by the many consultants listed in the book's beginning - or just one of them - that in Danish a certain theory is not called "documentary-hypothesis" when the books of Moses are divided into many different sources. In addition, this view has for long been in decline within the Old Testament research. Also, this kind of source distinction has no basis for a number of researchers' scepticism in relation to Moses as a historical person. Nevertheless, the reservations should not prevent anyone from reading "The Enigma of the Son of Pharaoh's Daughter" with profit, especially for the sake of its literary qualities. It has the ability to captivate and occasionally to disquiet, as well! Ove von Spaeth: "The Enigma of the Son of Pharaoh's Daughter: Moses' Identity and Mystery Re-evaluated", Assassinating of Moses, vol. 2, 239 pages, C.A. Reitzel publ. According to the Bible, it was Moses who led the children of Israel out of Egypt. The Bible shows Moses as a Hebrew boy who was brought up by Pharaoh's daughter - and that he later got a great position by the Egyptian court. When it comes to the history of ancient Egypt there are extensive and rich sources to illustrate what happened. Nevertheless, it has so far not been possible to find confirmation - either for Moses existence or the Israelites' exodus. The Egyptian sources are apparently completely silent about Moses and the events mention in the Bible - and this has led many historians to the view that the Bible's account on Moses is fictional. But now, a Danish researcher and author has discovered what - by international standards - has to be considered as sensational evidence of a connection between the history of Egypt and the existence of Moses. The author Ove von Spaeth presents in his new book-series, "Assassinating Moses", a number of convincing arguments, pointing to Moses as a real, historical person in ancient Egypt. It is not the first time that an author attempts identifying Moses within Egyptian history. Most of the previous attempts, such as Ahmed Osman's book from 1990: "Moses, Pharaoh of Egypt", has placed Moses in connection with Pharaoh Akhenaten. But despite the many well-intentioned attempts nobody has so far been able to produce the really convincing details that give a plausible agreement between the Bible's account and the Egyptian historical sources. Ove von Spaeth, however, has in his first two books of the series, now published, achieved that the puzzle come right. The pieces in the biblical narrative and the pieces from the Egyptian historical sources are now linking exactly into each other, and Ove von Spaeth creates - based in the history of Egypt - a picture of the Bible's events showing to be persuasive credible. It is in fact a simple "trick" that has led Ove von Spaeth on the track of the right Moses - and giving in the same time the explanation of why no Egyptologist or other historians have so far found the correlation between the Egyptian sources and the Bible's account. Ove von Spaeths "trick" is that he has discovered a new method to date the events mentioned in the Bible - and, thus, it has become clear that these events must take place 200 years earlier in Egypt's history than historians and theologians previously have assumed. This leads it to a very different era in Egypt, which will be the focus of the investigation; and here it evidently appears that the historical events and details from the Bible's text fit together as hand in glove. The first trace, bringing Ove von Spaeth forward to the time the events will take place, is Rabbi Isaac Abrabanel - a 14th century figure writing about Jewish heritage of history - and here he refers to that three years before the birth of Moses, on the stellar sky a special conjunction lined up - that is a rare grouping of the planets. This reference put Ove von Spaeth on track - for such a conjunction can be dated with 100 percent accuracy by modern astronomical calculations, and it appears that if Rabbi Abrabanel's information is correct, the event must have taken place in 1537 BC. - Thus, Moses must have been born three years later - that is, in 1534 BC. It turns out that once this date is taken into account Ove von Spaeth succeeded to make the puzzle come right, piece by piece. Bible's account - and the historical details from the Egyptian-preserved records - show through his interpretation to fit together in minute detail. The Bible mentions the Pharaoh's daughter - and according to the established date it can only be Hatshepsut who at Moses' birth was not only the daughter of the ruling Pharaoh Tuthmosis I but was also the Crown Princess and because of this - as following the Egyptian tradition - she had the name Pharaoh's Daughter as her official title. The specificity of Hatshepsut is that she herself becomes a ruling pharaoh - and by this she is unique in the history of Egypt. There are incredibly many concrete details in Ove von Spaeth's arguments. They provide a convincing overall picture which strongly supports that he has presented that the historic events in Egypt and the accounts in the Bible which fit together - and that the Bible's text in this respect is thus not fictional but based on real events. But there is no doubt that Ove von Spaeths revelations also will be subject to criticism. For example, it will hardly be accepted plainly by several orthodox circles that he appoint Moses as an Egyptian and not a Hebrew. According to Ove von Spaeth's interpretation Moses is not a foster child as the Bible has made him, but rather a true son of Pharaoh Hatshepsut and, in fact, heir to the Egyptian throne. The reception of "the ark" on the river Nile as the Bible describes is, according to Ove von Spaeth. a royal initiation ceremony. A similar ceremony is known not only from Egypt but from a wide range of other cultures - for example from the Danish legend on King Skjold. Ove von Spaeth, however, feel that the Bible's explanation on the Jewish foster child by the Egyptian pharaoh is a later rationalization where the Jewish commentators have refrained from including certain parts of the Egyptian background in order to "embellish the story." Ove von Spaeth's huge work on Moses breaks down in a series of five books. In his first book, "The Suppressed Record", this author points out, among other things, that the name Moses is not Hebrew. However, it is an Egyptian word for "child". Not new information but often forgotten by the public. Hatshepsut's father - who, according to von Spaeth, is the grandfather of Moses - bearing the name Tuthmosis (I) - signifying 'child of (the god) Thoth'. Moses, the son of Hatshepsut, would have followed his mother on the throne, and also be named Tuthmosis (III). But von Spaeth presents in addition a wide range of historical data that could substantiate the assumption that Moses was exposed to a plot. 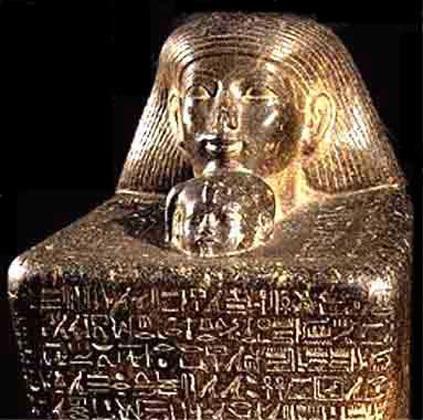 Hatshepsut's consort also named Tuthmosis (II) had a son to whom she was not the mother. It was this other son, according to von Spaeth's interpretation, who was behind a plot that put him on the throne and implied exile of Moses and subsequently meant the destruction of the inscriptions and records, related both to Hatshepsut and especially her son. Ove von Spaeth presents a convincing amount of evidence where both the Bible's account and the historical facts are linked together. The most compelling argument seems to be a star map which von Spaeth has analyzed by astronomical science in this just-released Volume II: "The Enigmatic Son of Pharaoh's Daughter". In this second book Ove von Spaeth appoints the historical sensational identity of Moses - by making him the same as the historical person who is known in Egypt under the name Senmut. Senmut had a large number of significant appointments and titles at the royal court of Egypt under Pharaoh Hatshepsut - offices that Ove von Spaeth highlights as concerning a heir to the throne. But Senmut disappeared without a trace. He was, among other things, Hatshepsut's architect - and, in this position, he built a tomb construction to himself directly under the temple, he built for Hatshepsut. The ceiling of this tomb has Senmut features a star map - and it is this map that is Ove von Spaeths strongest argument and document for that Senmut is Moses. Ove von Spaeth has succeeded to demonstrate that this star map is not a random list of stars and planets - what researchers previously thought - but is a map with a registration of a very special and rare astronomical event. This allows the map dated with an accuracy of hours! The exact dating of the map provides a point of time: 10 am on 7th May 1534 BC. In connection with the aforementioned date of Moses birth to 1534 BC - and the Rabbinical Writing's information about he was born in the month of adar (February) - and that his sailing on the river Nile, according to the Bible, is three months after his birth - then Senmuts star map fits also to the smallest detail to be a recording of a particular rare astronomical event that can be associated with Moses - the child - of the reception by Pharaoh's Daughter at the Nile. According to von Spaeth it is thus a royal inauguration taking place at a particular astronomical selected opportune moment. He argues that it is the case of Senmuts own inauguration as heir to the throne - and therefore this particular star map has been established, placed in the ceiling of his (empty) tomb. Ove von Spaeth's dating of this map, to be called the world's oldest star map, has been published in the renowned scientific journal "Centaurus International Magazine of The History of Mathematics, Science, and Technology, vol 42; 3, 2000. Von Spaeth has received backing from many researchers, such as Dr.scient. Kristian Peder Moesgaard, a university lecturer at the Department for the History of the Exact Sciences, at the University of Aarhus, and he is former Director of Steno Museum, Denmark's Museum of the History of Science, at Aarhus. But Ove von Spaeth must also be ready to come into headwind. It can be followed, partly by the debate the books have raised and now being presented too on the Internet (www.moses-egypt.net). For on the one hand he has a different approach to certain chapters of the orthodox Jewish history, an action of which he probably will be exposed to some beating. However, Ove von Spaeth is offering evidence that the Bible is reasonably accurate in many cases of its historical presentations. This comes at a time when a number of Danish theologians have set themselves at the head of a belief that the Bible accounts must be seen as most often fabricated and therefore must keep a distance to archaeological and historical research. These theologians have received some international attention - and Ove von Spaeth's arguments that the Bible might contain much more historical facts than hitherto presumed will be of very much inconvenience. Ove von Spaeth: "The Enigma of the Son of Pharaoh's Daughter" - Assassinating Moses (2), Reitzels Publishers, 239 pages, illustr.